Deciding what to eat at a restaurant can be tough going, especially when they don't have those helpful numbers next to the meals. Helping you pick the best things to eat at restos that don't have ball pits, Chewsy. 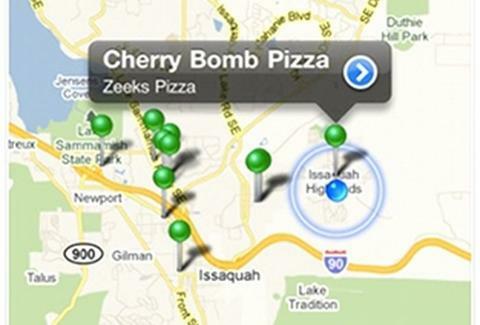 Just out of private beta, this free Jobs-phone app -- developed by four Microsoft vets who were disappointed by the information superhighway's inability to find them Seattle's best chicken wings -- ditches resto reviews in favor of crowd-sourced info on specific menu items at your current dining location/ nearby eat-spots in an attempt to provide what they call "Location Enhancement", ironic as that's typically reserved for the area above the stomach (oh snap, boobies!). It all starts with a menu guide that allows you to browse grub purveyors (starting with the closest) for individual dishes, providing brief diner feedback and rating them on a five spoon scale, or it can just map the top 25 edibles within anywhere from .5 to 10 miles away, though around 8 Mile(s) things tend to cost more Cheddar, Bob. 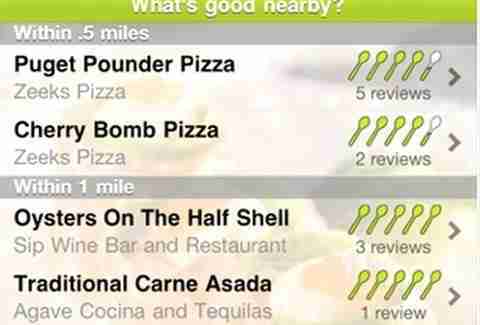 You can also search for a specific restaurant regardless of location, and easily share your own reviews via F-book/Twitter thanks to whimsical app-generated comments based on the number of spoons you give a dish, which include things like "the Shredded Chicken Noodle Soup at Szechuan Noodle Bowl doesn't need car keys to drive me crazy", which makes about as much sense as a band called the Fine Young Canniba...wait, are you sure this is chicken? Chewsy already lists places in 15 North American cities (though you can add a restaurant anywhere) and as soon as this month, you will be able to upload food shots, as well as see what your F-book friends have been eating -- a nice break before you get back to Big Mac'ing on Wendy's.